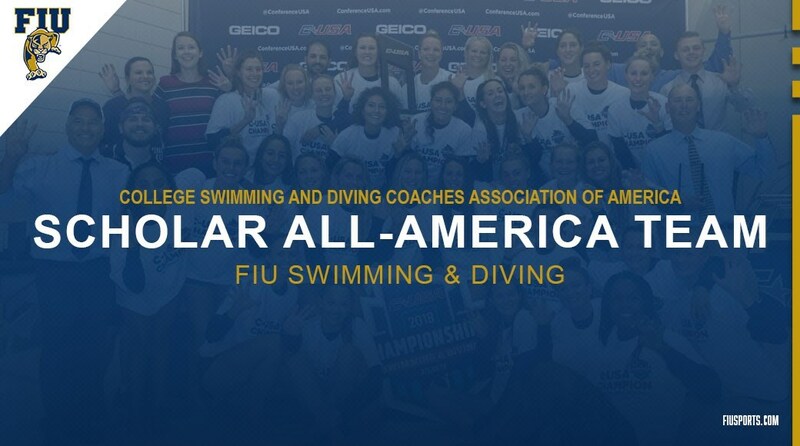 MIAMI, Fla. — The FIU women’s swimming and diving team has been named a Scholar All-America team based on their academic performance in the 2018 spring semester announced by the College Swimming and Diving Coaches Association of America (CSCAA) Tuesday. The FIU women’s squad posted a team GPA of 3.53, which ranked as the second-highest among all Division I teams in Florida. Twenty-three members of the Panthers’ roster posted over a 3.0 GPA during the semester, including seven with over a 3.75. All six Conference USA teams were recognized as Scholar All-America teams. Founded in 1922, the College Swimming Coaches Association of America (CSCAA) — the oldest organization of college coaches in America — is a professional organization of college swimming and diving coaches dedicated to serving and providing leadership for the advancement of the sport of swimming and diving at the collegiate level.